Remember, most experts were advising investors to stay away from mid & smallcaps in 2018. Well, it turns out that selling has continued in the broader market in 2019 as well. In comparison, both Sensex and Nifty closed the year 2018 on a positive note with single-digit returns, but broader market witnessed double-digit cuts in the same period. Midcaps have in the recent past underperformed the largecaps. Over the last 12 months, midcaps have corrected 19 percent as against the Nifty’s decline of 2 percent. However, over the last five years, midcaps have outperformed by 46 percent, said a Motilal Oswal report. The trend seems to have continued in 2019 as well. The S&P BSE Sensex has risen a little over 1 percent while BSE Midcap and BSE Smallcap index have dropped more than 7 percent each so far in 2019, data compiled by AceEquity showed. “The Nifty managed to breakout 10,980 despite midcap and smallcap stocks being so bluntly colourless in the recent times. Nifty heavyweights, especially RIL, FMCG, IT and banking heavyweights did well in recent past resulting in Nifty retaining 10,600 levels followed by sustained buying towards touching the high of 11,118,” Jaydeb Dey of Stewart & Mackertich Wealth Management told Moneycontrol. “Given the current macro-economic scenario and upcoming general elections, smart investors are pouring money into the index heavyweights only,” he said. Data suggests that the broader market remains under pressure. As many as 16 stocks in the S&P BSE 500 index and midcap index fell 20-60 percent in 2019, year-to-date. The list includes Central Bank of India, SAIL, Wockhardt, ICICI Securities, Adani Power, Dewan Housing Finance, Reliance Infra, Gruh Finance, and Exide Industries. 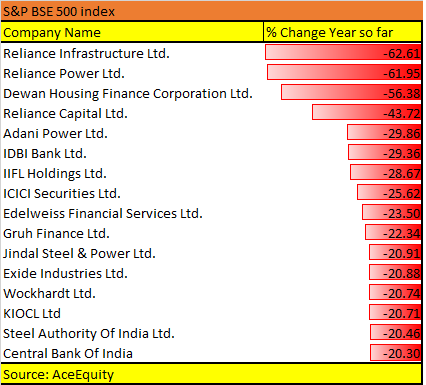 In the S&P BSE Smallcap index, more than 150 stocks plunged 20-60 percent in 2019 (YTD), which include Punj Lloyd, Unitech, KPIT Technologies, Rolta India, LEEL Electricals, Reliance Naval, Dena Bank, Welspun Corp, Sintex Industries, Zee Learn, IVRCL, and Sterlite Technologies. Analysts are of the view that volatility is likely to increase as we head towards elections and investors should stay away from mid & smallcap stocks as well as high beta names which are mostly from the broader market. “With the Budget behind us, we are now entering the zone of enhanced political activity between now and general elections in May 2019 – the recent political spectacle involving the CBI in West Bengal is a case in point,” Elara Capital said in a note. “The broader markets bore the maximum brunt with midcaps down about 7 percent in 2019. Our back-testing for historical periods (2004 -2018) shows that during times of market uncertainty, “quality” stocks outperform,” it said. Elara Capital recommends 11 high-quality stocks with good earnings visibility and reasonable valuations which include names like Castrol India, Cyient, Eicher Motors, Gillette India, GlaxoSmith Consumer, Infosys, ITC, Maruti Suzuki, Oracle Financial Services, Sun TV and Tata Elxsi. ROCE (return on capital employed): ROCE >15 in each of the last five years. Usually, companies with moats and capital allocation discipline would fit this criterion. NOPAT margin: Net operating profit after tax margin (NOPAT) should be either stable or increasing. The tolerance for stability is set at 10 percent. For example, if a company’s NOPAT margin is 10 percent in year 1, we expect the company’s margin to be greater than 10 percent in year 2 or at least not below 9 percent. Companies with an increased or stable NOPAT margins are those which have one or all the following characteristics: (a) can pass on cost escalations; (b) have pricing power, and (c) benefit from operating leverage as capacity utilisation increases. Leverage: Net debt-to-equity ratio of less than 1 in the latest FY. Low debt companies are those that fund business growth with internal funds, less exposed to financial risk and have greater predictability in PAT. Free cash flow yield: FCF yield that is positive in at least 4 out of the last 5 years. Positive FCF yield is less affected by accrual accounting and also generate adequate cash to meet capital expenditure requirements. Overall Score: Companies that score in each of the above criteria have been considered for the final list.